Wow! I have been having a great week! I am working on a beautiful wedding for 11-11-11, and I met my flower hero - Ariella Chezar (I felt like a little kid meeting Cinderella in Disney) !!! I felt tongue tied, awestruck. 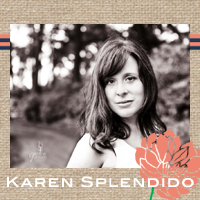 Her work is a constant source of inspiration for me, and her book Flowers for the Table is in my Top 3 of my flower library. If you haven't seen her work, you just have to take a peek http://www.ariellaflowers.com/ . She was very nice and gracious while I sputtered my words. Okay, I have to stop gushing - still flabbergasted : ) . Things are slowing down, well sort of now that wedding season 2011 is over. This winter, I will be busy planning away and sourcing material for the 2012 season. For those of you who have worked with me before, you know how crazy I get to make sure the whole design is seamless - I love the entire creative process, and bringing a clients vision to life (or their mothers : )). Really, I don't just cut up flowers and plunk them in a vase the day before and that's all she wrote. I plan each event thoughtfully and carefully - the #1 reason I only take one full service event per week. I just can't justify short changing a couple to make more $$$. Maybe not smart business wise, but floral design it is a lot of work physically. These nut jobs keep my pretty busy too. To say that life is a balancing act is an understatement. But for all the things you are passionate about in life, time is simply created. For me - family (dog included), flowers, and running just work together. I feel very fortunate. These were taken at the Mass Audubon in Wellfleet. Makes me really miss my garden. Hopefully this winter in upstate New York will not be cruel.... I know, I'm laughing too, but I can dream. Sorry for my long absence, I have been caught up in the back to school, trick-or-treat Mommy rat race for the past month. Yes, it is fun to be part of that race - feels like I am finally in the lead for once : )!!! Okay, I am not going to talk about my wonderful family or hectic schedule anymore - but the topic does come up often. Back in flower mode, I wanted to share some of my thoughts on bridal bouquets. For me, it is the single most important floral aspect of a wedding. The bouquet is a MAJOR accessory, and it should compliment your gown (yes I must see a picture of your gown before giving my two cents on what type of bouquet would work best) and reflect your personality. Some things to consider are: season, color, and size (it should be scaled to your proportions). However, I do love large lush bouquets - it is your only time to have one right? Right???? You are probably thinking, what about the budget? When asked, I will always tell a future bride that this is the area not to skimp - if possible. 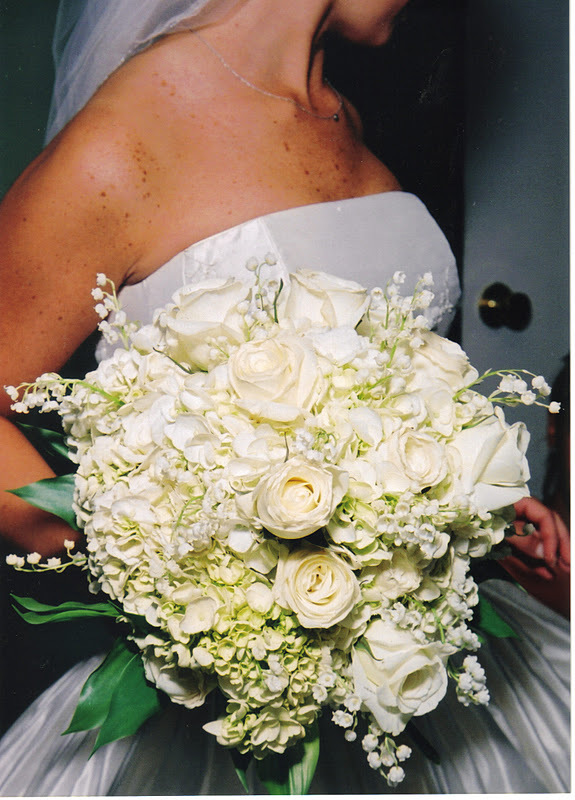 The bouquet will be featured in almost all of your wedding pictures and will most likely be in the wedding portrait that will hang on a wall in your home FOREVER. No doubt the other florals will be memorable, but it is unlikely you will hang a picture of your centerpiece or bridesmaid bouquets in your living room. My mother always looks at hers (42 years later) and is still upset that she settled on carnations to cut costs. I am not saying that you should go ahead and drop $500 - but to simply go ahead and treat yourself. What is reasonable? I would say anywhere from $150 and up. Just my opinion and I am sure other florists will tell you differently - but remember the quality of the blooms and the experience of the designer is highly important. The old adage "you get what you pay for" could also be translated here to "You get WHO you pay for." When designing a wedding, I save the bridal bouquet for the very last (I love saving the best of everything in life for the last). The blooms have been carefully hand selected and brought to their peak. Everyone knows when I am ready to design a bouquet, because they are not allowed to step foot near me or utter a word until its completion. I can be a bit of a diva like that. I really do put my all into these beauties and never settle until it is absolutely perfect for the bride. I am pretty hard on myself in general, so my character "flaw" pays off in this department. I will leave you with some lovelies.